Becoming more popular among both residential and commercial customers in recent years, prefinished hardwood flooring is more common, but before the unfinished hardwood flooring was niche of the flooring industry. With both having its pros and cons, leaving homeowners unable to decide which is better suited for them. Today we at Mike’s Custom Flooring would like to discuss prefinished VS and unfinished wood floors. –	For many home improvement projects, prefinished is the most convenient option. –	The durability is exceptionally high. –	The coloring and staining on the boards is more uniformed and consistent. –	Specialized treatments such as anti-scratch coating to resist minor surface damage. There are limitations with lengths, widths, grain, colors, and other common customer preferences. Should you want to refinish or re-sand your floor in the future, the durability of the finish can make it a challenge to remove from these surface layers. Unfinished flooring is raw wood. Installing include sanding and finishing the floor on site. There are quite a few different wood species and as a result, the natural color variations available with unfinished hardwood flooring. 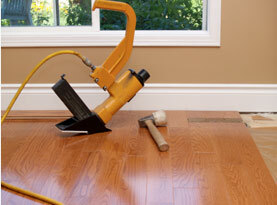 You can customize the wood floor installation as it requires on-site finishing. Inlays, borders, and other flooring features can personalize the flooring. Should you have a specific look that you have as a goal for your kitchen, hallway, entryway, living room, or office, having the ability to customize can be ideal. A few more benefits are listed below. 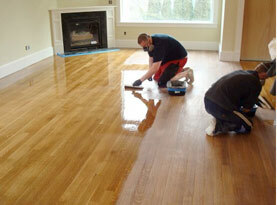 – You have more flexibility to re-sand and refinish the floor. – No beveled edge collecting dust or dirt. As we sand the floor, we eliminate any and all height differences between the boards. 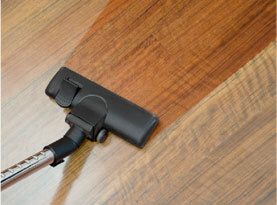 – For a perfect flush with the rest of the floor, you can add inlays after you sand. 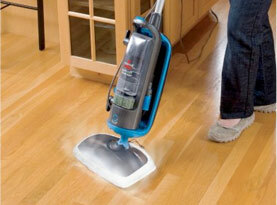 – You will have a fresh sealing after finishing the newly installed floor. The time it takes to complete the installation process is far longer. The floor needs to be manually sanded and finished after installations. The staining is also requiring and then you have to provide time for it to cure. There is not necessarily one better option than another when it comes to prefinished or unfinished hardwood flooring. In the end, the individual preferences should way out the pros and cons. Whether you prefer the natural imperfections in unfinished flooring with the option to refinish it, or prefer the perfectly prepared, flawless, ready-to-install flooring, Mike’s Custom Flooring is readily available to help you with the entire installation process in your Eastern Panhandle of Berkeley and Jefferson Counties in WV as well as Frederick, Loudoun and Fairfax Counties in VA home.